Travelling in Western Honshū ( 本州西部 ) reveals a tale of two coastlines. San-yō (literally ‘sunny side of the mountains’), looking out over the Inland Sea, boasts the bigger cities, the charming narrow-laned portside and hillside towns, ceramic history and the fast train. This is the coast that holds the region’s big name – indelibly scarred, thriving, come-have-a-drink-with-us Hiroshima. On the other side of the dividing Chūgoku mountain range, San-in (literally ‘in the shade of the mountains’) gazes out across the expanse of the Japan Sea. Up here, it’s all about an unhurried pace, onsen villages that see few foreigners, historic sites, wind-battered, rugged coastal views, and warm welcomes. Turn away from both coasts and take an inland route for hikes along gorges and through caves. Or leap (by ferry or cycle) off the mainland altogether to the Inland Sea and its galaxy of islands. To most people, Hiroshima means just one thing. The city’s name will forever evoke thoughts of 6 August 1945, when Hiroshima became the target of the world’s first atomic-bomb attack. Hiroshima’s Peace Memorial Park is a constant reminder of that day, and it attracts visitors from all over the world. But leafy Hiroshima, with its wide boulevards and laid-back friendliness, is a far from depressing place. Present-day Hiroshima is home to a thriving and internationally minded community, and it’s worth spending a couple of nights here to experience the city at its vibrant best. Most sights can be reached either on foot or with a short tram ride. To catch a tram to the Atomic Bomb Dome and Peace Memorial Park area, hop on tram 2 or 6 at the terminal in front of the station (south exit) and get off at the Genbaku-dōmu-mae stop. Offline map Perhaps the starkest reminder of the destruction visited upon Hiroshima is the Atomic Bomb Dome ( 原爆ドーム ; Genbaku Dōmu), across the river from the Peace Memorial Park. Built by a Czech architect in 1915, the building served as the Industrial Promotion Hall until the bomb exploded almost directly above it. Everyone inside was killed, but the building itself was one of very few left standing anywhere near the epicentre. Despite local misgivings, a decision was taken after the war to preserve the shell of the building as a memorial. Declared a Unesco World Heritage Site in December 1996, the propped-up ruins are floodlit at night, and have become a grim symbol of the city’s tragic past. Offline map From the Atomic Bomb Dome, cross over into Peace Memorial Park ( 平和記念公園 ; Heiwa-kōen), which is dotted with memorials, including the cenotaph Offline map ( 原爆死没者慰霊碑 ), which contains the names of all the known victims of the bomb. 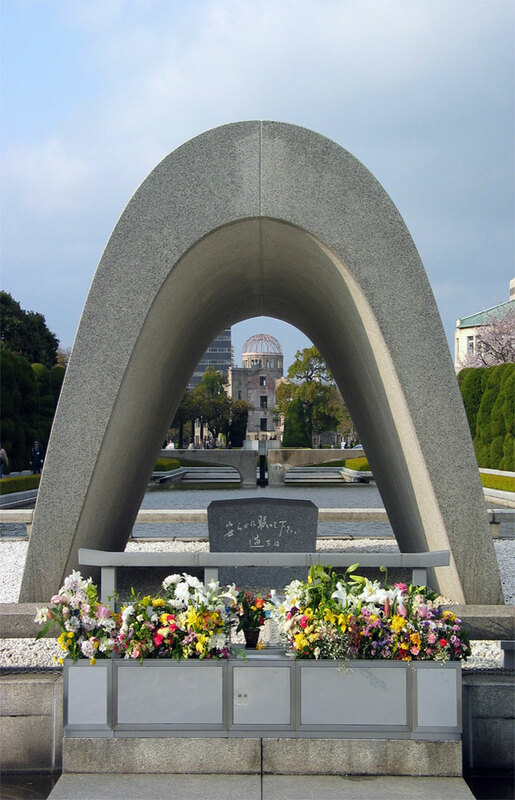 The cenotaph frames the Flame of Peace Offline map ( 平和の灯 ), which will only be extinguished once the last nuclear weapon on earth has been destroyed, and the Atomic Bomb Dome across the river. Just north of the road through the park is the Children’s Peace Monument Offline map( 原爆の子の像 ), inspired by Sadako Sasaki. When Sadako developed leukaemia at 11 years of age in 1955, she decided to fold 1000 paper cranes. In Japan, the crane is the symbol of longevity and happiness, and she was convinced that if she achieved that target she would recover. She died before reaching her goal, but her classmates folded the rest. The story inspired a nationwide spate of paper-crane folding that continues to this day. Nearby is the Korean Atomic Bomb Memorial Offline map ( 韓国人原爆犠牲者慰霊碑 ). Many Koreans were shipped over to work as slave labourers during WWII, and Koreans accounted for more than one in 10 of those killed by the atomic bomb. Offline map ( 平和記念資料館 ; www.pcf.city.hiroshima.jp; 1-2 Nakajima-chō, Naka-ku; admission ¥50; 8.30am-5pm, to 6pm Mar-Nov, to 7pm Aug) The lower floor of Hiroshima’s peace museum presents the history of the city and, interestingly, explains the living conditions and sentiment during the war years leading up to the dropping of the bomb. Upstairs, along with a depressing display showing the development of even more destructive weapons in the years since, are rooms filled with items salvaged from the aftermath of the explosion. The displays here are harrowing – ragged clothes, glasses, a child’s melted lunch box – and there are some gruesome photographs of victims. It can be overwhelming, and you might not want to bring young children through here, but it’s a must see in Hiroshima. In the corridor on the way out, it’s well worth taking time to watch the video testimonials of survivors. Offline map ( 国立広島原爆死没者追悼平和祈念館 ; 1-6 Nakajima-chō, Naka-ku; 8.30am-6pm Mar-Nov, to 5pm Dec-Feb, to 7pm Aug) A walkway circles down to a contemplative underground hall of remembrance, and a room where the names and photographs of atomic-bomb victims are kept, along with testimonies from survivors, in several languages. It was built by architect Tange Kenzō, who also designed the museum, cenotaph and eternal flame. The testimonies, which can be viewed on video, vividly evoke the chaos of the time. Offline map ( 縮景園 ; 2-11 Kami-nobori-chō; admission ¥250, combined ticket with museum ¥600; 9am-6pm Apr-Sep, to 5pm Oct-Mar) Modelled after Xi Hu (West Lake) in Hangzhou, China, Shukkei-en was built in 1620 for daimyō (domain lord) Asano Nagaakira. The garden’s name means ‘contracted view’, and it attempts to re-create grand vistas in miniature. The garden was totally destroyed by the bomb, though many of the trees and plants survived to blossom again the following year, and the park and its buildings have long since been restored to their original splendour.